Today I’m going to talk about a place I get asked about from time to time. The Crowley Mausoleum has a storied past but it currently sits forgotten. How it got that way is quite a tale. Most of what I was able to find out about it was from an account from Forest Crowley, a descendant. James Crowley was born in 1772 in Pittsylvania County, Va. His parents, Benjamin and Sarah, brought the family to Oglethorpe County, Ga. in 1785. Benjamin died in 1817. In 1822, James received about 500 acres in Decatur from a land lottery and farmed it until his death in 1828. He later owned additional farms and did well financially, owning a number of slaves. The family put their cemetery on a hill overlooking their land. When James died, he was buried there as was his wife, Dorcas, in 1852. Son Allen Crowley owned the land from 1829 to 1846, when he moved his family by wagon train to Northern Mississippi. Younger brother Seaborn Crowley and his family took it over from 1846 to 1896 when it was purchased by the Hill Family (also Crowley relatives). According to Forest Crowley, the cemetery was originally in the middle of the pasture on the farm surrounded by a barbed wire fence. For a number of years in the 1950s, this fence fell into disrepair and livestock were able to enter and leave the cemetery. In 1960, the Hills sold part of the land and leased the other part so that the Columbia Mall could be built. Completed in 1963, the mall was near the intersection of Memorial Drive and Columbia Road. 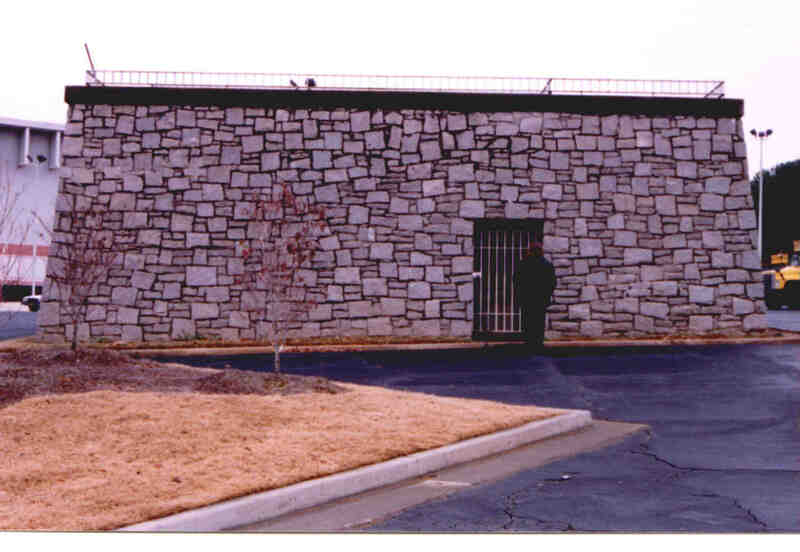 The builder agreed to build a mausoleum around the cemetery, which was in the parking lot. The builder had to dig down about 20 to 25 feet on all sides of the cemetery and then build the building around the cemetery. There were 40 or 50 slave graves buried surrounding the cemetery. Sadly, no effort was made to save those graves and they were built over. Currently, the 11 graves (nine of them of the box variety) at the top of the mausoleum are members of the Crowley, Cross and Hawkins families. Seven are adults and four are children. These pictures appear to have been taken after Avondale Mall had closed around 2000. I believe they originally had markers on top of them but those were later vandalized. Many people I’ve talked to remember navigating around the mausoleum when going to the mall to shop. One even told me he remembered as a teen learning how to drive in that parking lot and nearly hitting it. A bronze plaque explained the history of the site. I’m not sure where the part about the land grant being from the king of England came from. It contradicts everything else I’ve read. The plaque was later pried off the mausoleum and has vanished. This plaque has since been pried from the mausoleum and stolen. I can’t attest to it’s truthfulness as the research I’ve done says nothing about a land grand from the king of England. Photo by Lois Mauk. The area around the mall changed in the late 70s and 80s as white flight hit and some of the mall’s stores began to close. When Macy’s closed their clearance store there in 1995, the writing was on the wall. In 2001, it finally closed and sat empty until Walmart purchased the land and demolished the mall. After some community protests, construction for a Supercenter began and it opened in 2008. 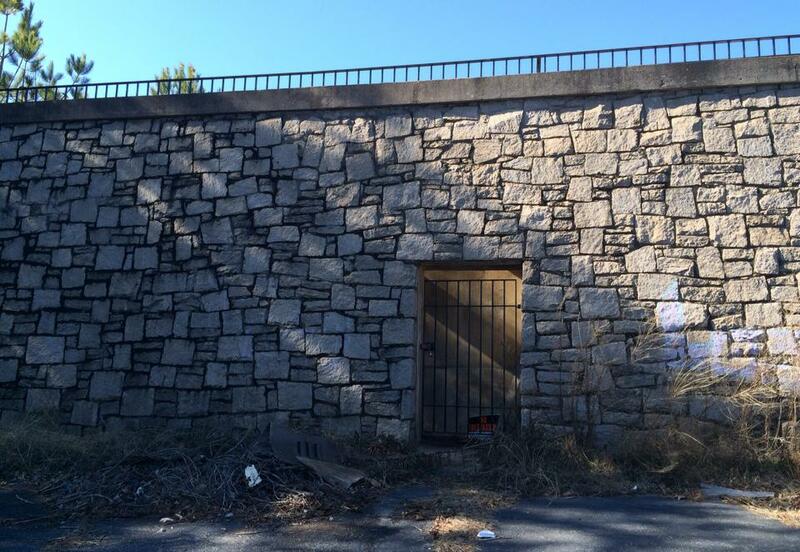 According to Forest Crowley, there’ve been a number of break-ins at the Mausoleum over the last several years and some of the headstones on top of the box tombs were broken and thrown to the parking lot, then thrown away. Other headstones were stolen. Due to the reconfiguration of the parking lot, the Crowley Mausoleum is now mostly hidden by trees and is behind a Napa Auto Parts store. You can’t see it from the parking lot but if you know where to look, you can glimpse it as you’re driving past the Napa on Memorial Drive. 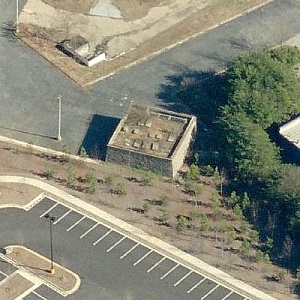 This is an aerial view of the Crowley Mausoleum, courtesy of http://www.roadsideresort.com. I knew about the Crowley Mausoleum for a while but hadn’t stopped to get a good look at it. To be honest, that stretch of Memorial Drive is rather sketchy and I wasn’t keen on poking around on my own. It wasn’t until January of this year, when I had my friend and fellow cemetery hopper Jennifer with me, that I got an up close look at it. Unfortunately, being hidden from sight hasn’t done it any favors. This is what the front of the Crowley Mausoleum looks like today. The door is chained and locked. Trash and debris litter the area. The mausoleum is about 20 feet high and unless you’ve got a ladder (or as I joked with Jennifer, a cherry picker), you can’t see the top of it or the graves. It looks like someone’s spray painted the area to the right of the door. 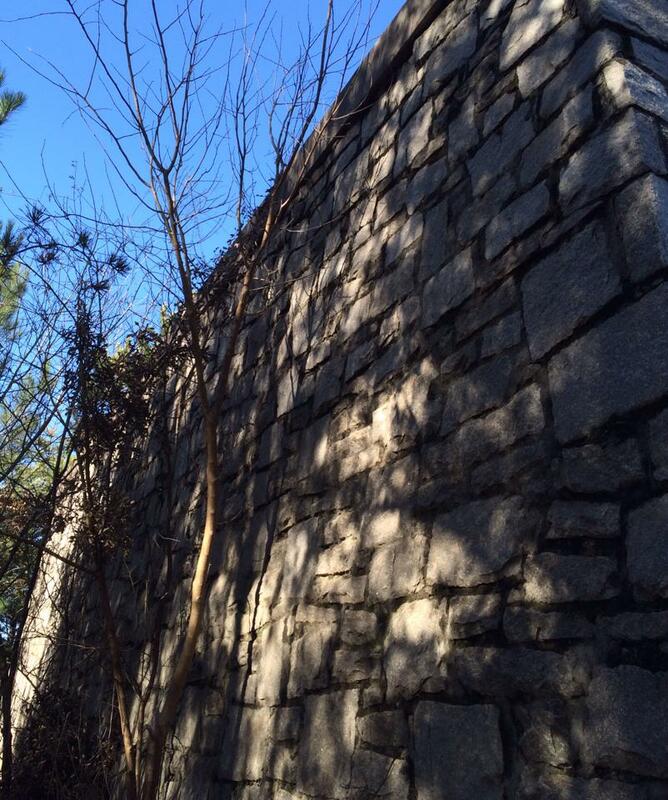 The walls of the mausoleum are about 20 feet high and unless you have a ladder, you can’t see the top. I don’t advise trying that. I did take a look up the stairs to try to get a glimpse of the view. Here’s the view from the stairwell. A pile of leaves and other trash sit at the foot of it. I have no idea who is currently in charge of taking care of the Crowley Mausoleum now, if there is anyone doing so. I haven’t contacted the DeKalb History Center yet but I plan to. Maybe they know. I worry that if it continues to deteriorate, someone’s going to break into it and vandalize what’s left of the graves at the top. If there IS anything left of them. Interestingly enough, the Crowley Mausoleum isn’t the only example of a cemetery in a parking lot. This site shows aerial photos of some others around the country. Next week, I’ll visit the Stephen Martin Cemetery in Dunwoody (also in DeKalb County). It’s tucked away behind a large shopping center next to Perimeter Mall but is in better shape than the Crowley Mausoleum. I remember when I lived in San Antonio, TX in the early 80’s, there was a family cemetary to the right of one of the mall entrances. Maybe 5 or 6 graves. Always thought it sad that they built a mall around them. At least they did not disturb their rest. Hi, Davey! I’ve found there are quite a few of these parking lot cemeteries around the country. It’s rather bittersweet, really. It is a good thing they saved them but some of them look so desolate and lost. This is so sad. My daughter lives there–The historical Society *should* get involved! Thank you Traci. I remember driving past that but never knew there were graves on the top of it!! You are a great explorer! I am sure you already know about the one in Peachtree City , the Line Creek Baptist Church Cemetery behind the Best Buy store on Hwy 54 West.. The church sold the land to a developer and they agreed to save the graves. Janice, I did know about that one. I actually know some of the descendants and have been hoping to blog on that sometime soon. Cemetary off of Clairmont Rd @ Emory Campus called Hardeman Cemetary…30 + graves, last one buried about 100 yrs ago when the church moved to Glenwood Rd. There is a map with names and dates. Hardeman Primitive Church was located here until Emory came up from Oxford. This cemetery not being kept. Pine seedlings are growing throughout and getting larger. The Crowley Cemetary is my Great,Great Grandmothers Family Plot. Would love to know which Crowley you are descended from because I am also one of their descendants. Was Mary Jane Tuggle Crowley your 2nd great grandmother? I am descended from James and Dorcas Smith Crowley. About a year and a half ago I moved from DeKalb to North Fulton County. I am currently helping to care for the graves of several Crowley descendants who are buried in the old Roswell Cemetery. These folks are not in my direct line, but I do feel that it is important to preserve their plots since they are among the early leaders of Roswell. Thanks so much for that detailed article and pictures. I’m a descendant of those Crowleys. My 3rd and 4th great grandparents are buried there. James and Dorcas (Smith) Crowley, and Benjamin and Mary Jane (Tuggle) Crowley. My great grandmother was Lelia B. Crowley before she married, daughter of John H. Crowley who was the son of Benjamin and Mary Jane Crowley. I used to shop at that mall as a teenager and didn’t ever realize those were my relatives until I was much older. Hi Maurine Kennedy – I am from the Jeffery William Hudgins and Martha Ann Crowley Descendants. Forrest Hill and I are in contact with each other about this side of the Family. The Crowley Cemetery is well know to us all and I would love to get a group of new caretakers together to take control and keep it going forward. Anyone know of the Key holder now? At one time all lead descendants had keys to open it. Nice to meet you!! That means you and I are 4th cousins. My 2nd great grandfather, John H. Crowley was your 2nd great grandmother’s brother. So we share the same 3rd great grandparents. (Benjamin and Mary Ann Crowley) This info will help me with my work on Ancestry.com. I have her listed in my family tree but I have not followed up with any of her other info. I see now that there is quite a lot about her on Ancestry in the census records and on Findagrave. I actually bought Forrest’s book a few months ago and really enjoyed it. It was fun to read about the Crowley family and the area where the cemetery is. I recently had a direct male Crowley descendant 3rd cousin of mine do a DNA test for the Crowleyclan.com DNA study. Can’t wait to find out what it shows. You might enjoy looking at that website. I have no idea about a key. I can ask my 3rd cousin if he or his mom have a key, but I kind of doubt they do. 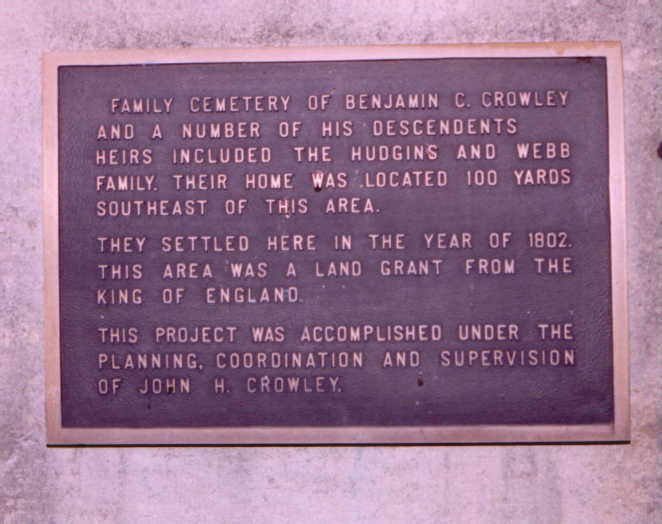 His and my more recent line of Crowley’s are buried in Wesley Chapel Cemetery in Decatur. Maurine Kennedy – this is awesome, very excited about all of this. My Grandfather Jeffery Clark Hudgins Jr. Forrest Hills Book has incorrect information on him but we have already discussed the corrections. Brenton, I don’t have the book in my possession now as I passed it on to other family members and I’m not sure who has it, but I believe there was an inaccuracy about my 2nd great grandfather, John H. Crowley as well. I think just the wrong person listed as his wife. But the book was still very interesting. Forrest Hill and I plan to get together soon he is down toward Covington and I have a Lake House on Jackson Lake and we have talked about getting together to compare notes and pictures. Hi, Maurine. You and I are distant cousins. James and Dorcas Smith Crowley are my 4th great grandparents. I am descended from their son Harrison, who was your Benjamin’s brother. A number of people from my branch are buried a Clifton Methodist Church in Decatur. Hey you guys! Let me know if you all ever get together and find someone to let you into the mausoleum. I would love to do a follow-up post. Will do. Since I was a kid I have heard all the stories of the old Hudgins/Crowley Farm and the Cemetery. My Mother Carolyn Hudgins Head went there as a little girl and her and my Father Harold A Head Jr before they were married in 1958 went to the Hudgins Farm for a Reunion and visited the Cemetery as well. Later in the 1975 when the article came out about the Oldest Burial Ground by Hugh Park was written the Hudgins all got together to go re-visit the Cemetery again and I went as well. lot and has the key to the cemetery.” Is that any of your relatives, Brenton? I have heard the name, I will poll the Hudgins Mob to see who knows him. Wondering how he would own the Cemetery though. Was there a contact # or reach information listed? My name is Phil Richards and I live at Canton GA. I am very interested in the discussion that this article has generated among the Crowley family. I found out just a few years ago that I am a Crowley descendant myself. Seaborn Crowley (1847-1932) was my g-g-grandfather. I have not been able to locate any living descendants of Seaborn and his wife Elizabeth Jane, so I would be interested in hearing about any that may be out there. Also I would very much like to find a photo of Seaborn. Is there anyone following these posts who could contribute information? Thinking that if we could plan a reunion at the Crowley Family Cemetery would be great. If I can ever find and get a Key – I would plan one. My name is Richard Bowers, my grandmother’s first husband in Roswell was John Crowley, a son of Seabourn, she had two children, Elizabeth and John, John passed away with no descendants in the early 40s, Elizabeth, Bessie, passed away in 1959. Her son William Allen, passed away recently, his son, Douglas Allen is still in Atlanta. I’m currently taking care of the Crowley plots in the Old Roswell Cemetery. I would love to speak with any of Seaborn’s family. If you know how I might reach then, please contact me at 404-556-3472. Richard Bowers, do you know how I may get in touch with the Douglas Allen you mention? I would like contact information as well. I take care of the Crowley family graves at the Old Roswell Cemetery and would be interested in contact information for any descendants of the Roswell Crowleys. My name is Clay Parks. I am a descendent of Hudgins family burried in the Crowley Family Cemetary. I use to go to the Cemetary with my grandparents, Charles W. Seagraves, Jr. and Mary Virginia Seagraves. I ended up with a large box of keys when they passed away. I am sure the old key to the Cemetary is in that box. 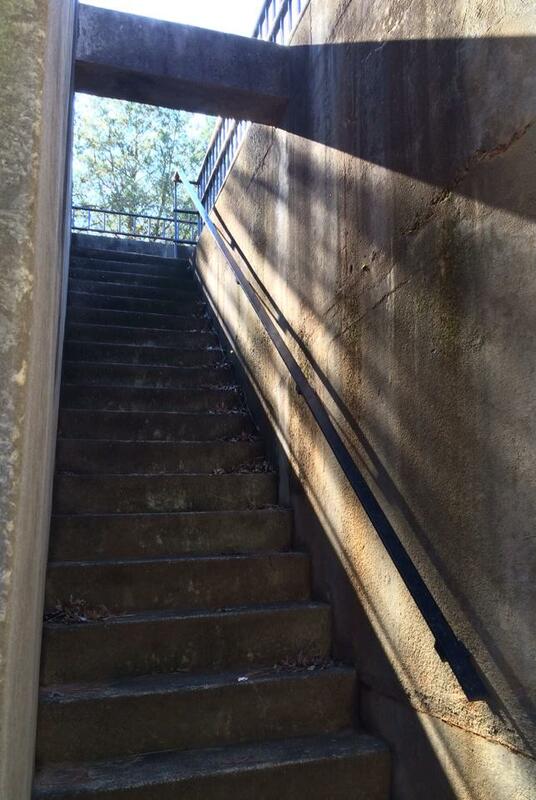 However, the chain securing the door used to access the Cemetary stairwell can now be slipped off of the lock. I been intending to search tax and property records in order to determine who owns the property. When I figure out who owns the property, I will post it on this website. I would be interested in seeing what could be done to preserve the property. Clay – Awesome that would be great. My Mother Carolyn Hudgins loved your grandparents and my Father Harold Head still talks about them when they would all get together at the Hudgins Farm back in the 50’s. Clay – I did the Clean Up Day at the Historic Crowley Family Cemetery this past Sunday with other Family Members and Community Members. I am a Crowley/Hudgins Descendant. I went to the DeKalb Cemetery Preservations Meeting and got some great information on the next step for us to take to get the Lot the Cemetery is in back under Family Control. My guess from my research is the holder of the Deed must have passed. We need to file an affidavit of Title and have it cross-referenced to the Property Owners Deed. Brenton Head 706 337-4330. James Parks – you could help maybe? Ok so far our Family members for Crowley are: Maurine Kennedy, Brenton Head, Forrest Hill, Clay Parks, Michael Hudgins. I am descented from James and Dorcas Smith Crowley and am related to the Spuuills by marriage on both my mother’s and father’s sides of the family. I am currently working on a brief bio of Seaborn Crowley to be used in an upcoming tour of the Old Roswell Cemetery. I would love to meet you and join have you join me on the tour. I have done lots of research on cemeteries in North Fulton which I would be happy to share with you. If you”re interested please email me. Pat – I would love to see the tour as well, my email is Day8cwby@aol.com and contact is 706 337-4330 – I am from the Crowley/Hudgins side. I would love to share information with you. Seaborn is not in my direct line, but I did some research on him for the cemetery tour. My research brought up more questions than it answered. For example I know that he had a store, but I don’t know what kind of store it was. I’ve been asked by the Roswell Historical Society to adopt this cemetery plot. I’ve enlisted the help of one of my first cousins and we’ve started to put some plants into the Crowley plot. I’m also planning to put white gravel down to retard weed growth. If you’d like to help, we’d welcome your participation. As for the Crowley Cemetery, my sister who is a title researcher, pulled the records on the cemetery property. Several years ago I tracked down the last surviving person who signed the agreement to preserve the cemetery. She was in her upper nineties at the time, so she probably has passed away by now. She said that over the years the cemetery lock had been changed several times. She also gave me permission to cut off the lock and replace it with a new one. My nephew and I are planning to do that this summer. I want to clean the markers that remain and get rid of the weeds. Please give me a call. My phone number is 770-879-1918. It’s nice to find another cousin. If the Lock on the Cemetery is replaced – Please make sure all the Family Members of each has a copy. If you would let me know who the others are, I’d be glad to give them keys. My plan had been to put a key in the DeKalb History Center which they could check out to descendants. The Roswell Historical Society cemetery tour which will include the Seaborn Crowley plot will be in late Sept. I’ll let you know when I get the exact date and time. I know so far – Maurine Kennedy, Myself, Forrest Hill, My Uncle Bobby Hudgins is the last of my mother’s siblings alive from Jeffery Clark Hudgins Jr’s kids. Also Pat – if you will let me know in advance when you might be at the Crowley Mausoleum to have the lock replaced and clean up I would love to be there and also have my Father who remembers a lot about the Farm and Family back then. Phil, I found a picture of your Seaborn Crowley. It’s very small, but we should be able to enlarge it. My scanner is broken, so I can’t email it to you right now, but if you’ll call me we can work something out. My number is 770-879-1918. Hi all. I enjoyed reading this article and all of your posts. I am a descendant of the Crowley family as well. My great-grandfather (as I have been told) was Jeff Davis Crowley, a son of Benjamin. I grew up near the cemetary and worked at the Macys in the mall as a teenager. 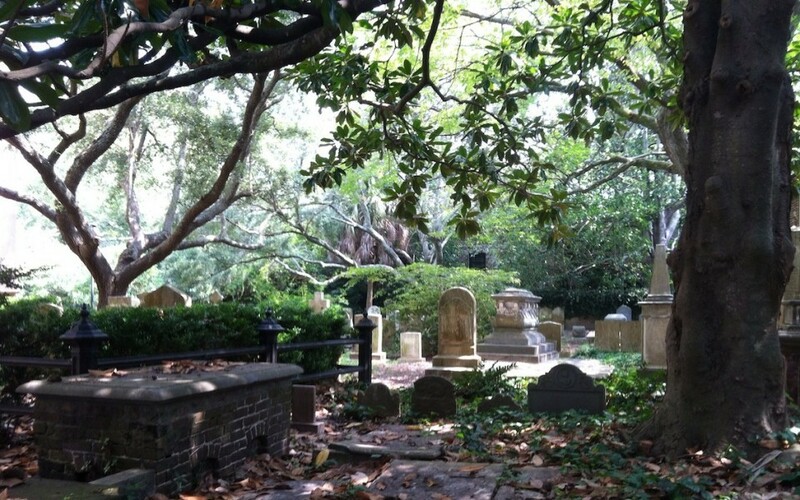 I would love to learn more about preserving the cemetary and meeting other family members. 🙂 perfect – I think mow that it is getting cooler we should all meet there – anyone have a key??? I have loved reading this post and all the comments. My Grandparents lived in Decatur off Columbia Drive on Oregon Trail next to Columbia High School from 1962 – 1977. 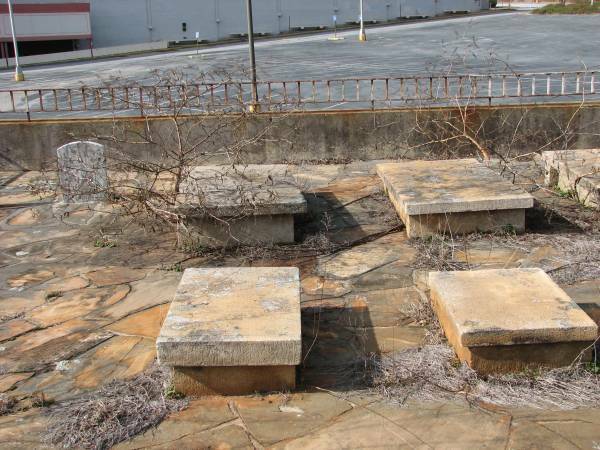 They would take me to Columbia Mall for ice cream and shopping in the 1970’s and I remember seeing this cemetery. It has been great reading about the history of it here that I never knew. Thanks so much! Thanks, Brad! I still get a lot of inquiries about the status of this cemetery. There are many descendants still nearby and a few recently did some work up top to clear off debris, etc. I too am a Crowley decendent. I recently moved to the Roswell area. My distant cousin Seaborn Crowley and his family are buried in the Old Roswell Cemetery. I have cleaned their headstones, but unfortunately one the lovely monuments has been vandalized. It is a Madonna but vandals have beheaded it. The Roswell Historical Society is raising money to repair the Madonna. More than half the needed funds have already been pledged. If you would like to contribute you can do so at the Roswell Historical Society website . This spring there will be a “homecoming” for decendents of people buried at Old Roswell. If you would like to attend, please check the Roswell Historical Society website later this spring or contact me at 770-879-1918. Does Any of the Hudgins, Crowley Family have Frances Greene Longs Contact information??? I believe she has the Key to access the Cemetery. Forrest Hill told me that the lock no longer works, but if you pull hard you can get in. You can reach Forrest at 770-860-8790. I see. This is all so very sad to me that no one seems to be in charge and organized in getting all together to save and protect this Family History. Thanks I will contact Forrest. I think Forrest and a few others do periodically clean there. I have told him I would be interested in helping if he will give me advanced notice of cleaning dates and times. I live in Roswell and do look after the Crowley plots there. I grew up in the area and just have an interest in old / neat features of our city. I was there yesterday with my daughter and I’m saddened to say that there is no longer any lock or chain on the gate. It was wide open when we arrived, around 3:30pm. I went up top and picked up the trash (no respect, that kind of stuff kills me). Unfortunately that area is on a slow decline, but at least it’s pretty hidden from plane view. I actually thought about purchasing a lock and chain and secure it again. After reading everyone’s posts, I won’t do that because I’m not related by any means. I’ll continue to stop by and check on things, my daughters school is so close by. If there is anything I can do for your family/relatives I would be more than happy to do so. By the way, my name is Che, I grew up on Sycamore St.
Hi, Che! Sorry it has taken me this long to respond to your comment. I had heard that the lock had been broken on the Crowley mausoleum door. Thank you for stopping to check on it. I recently moved to another part of Atlanta and am not as close to it as I once was, so I don’t get over there nearly as much now. It’s indeed sad that people don’t respect the past but choose to leave trash on it instead. I’m hopeful one of the family will get it secured again shortly. I would be glad to purchase a new lock and chain, but I don’t know how we could make the key available to other descendants. If anyone has a idea I would love to hear from you. I posted here a few months ago and have been meaning to get back in touch. My grandfather was Charles Seagraves. His side of the family (and I forget exactly how) was related to the Crowleys. In the 1970s we use to go to the cemetery. He had a key to the lock as so on. Anyway, I am an attorney and use to represent Walmart in some matters. A contact with the company has suggested that we reach out the the store manager to start the process of having Walmart determine if they have responsibility for the cemetery. I know that Walmart’s real-estate department’s address is on the tax mailing address for the parcel. I am out of the country right now, but am happy to follow-up on this when I return in a few weeks. Thank you so much for taking the time to clean up the cemetery. As a Crowley decendent I really appreciate your help. Pat – I think if we got a Combination Lock would be better than a Key. And James My Father who Married Carolyn Hudgins, her Father was Jeffrey Clark Hudgins Jr., His Father Jeffrey Clark Sr., and his Father Jeffery William Hudgins who married Martha Anne “Mat” Crowley. My Dad remembers the Seagraves at the Hudgins Family Farm Reunions. Brenton Head 706 337-4330. That’s a good idea. It would certainly be easier to email the combination to decendents than to make them all keys. If you still want to put together a caretakers group, count me in. There is a new FB posting today where Pictures were taken of the Mausoleum, the iron door was open and the Cemetery is overgrown and very poorly maintained. I would love to take charge of getting this in order and get a group there to clean up and re-lock the gate. Where is it posted on FB? I hate to hear this. I would love to meet all of my Crowley cousins sometime! It is on the “You’ve Lived in ATL a long time if…..” FB Page. You can see the Post but have to subscribe to the Group to be added to comment, which I did. Yes, I found it. I am on that page and just commented. It sure has stirred up a lot of interest. It’s amazing that so many non-family Avondale residents are interested. I have a commitment that day at Old Roswell Cemetery where Seaborn and Forrest Crowley are buried. Please keep me in mind for any future clean ups. If you have time, I would love to see pictures. Brenton, I will be at church on any Sunday, but if you ever do a Saturday if I am in town my husband and I will try to come. Thanks for planning it. Hope you get lots of help. Ok Maurine. I should have planned for a Saturday due to Church. Next time. Are you planning on having another cleanup day this spring? I’d love to participate. Yes, I will look at calendar and send out invite to all to participate and meet. Went by the Crowley Historic Cemetery yesterday and yes it is a mess again. Clean up Day planned for this Sunday, May, 22nd at 10:00am till we quit. I am going to attend the DeKalb Cemetery Preservations meeting tomorrow 12:00 – 1:00pm at the Historic DeKalb Courthouse and see what I can learn on getting this back under control and options to make it better for future Family Descendent’s of my 3 X Great Grandparents and 4 X Great Grandparents in this Cemetery. New combination pad lock put on the iron gate hopefully will help keep it safe until the lock can be fixed. I will make sure the Family members get the combination. Thanks for doing this. I wish I could be there to help with the clean up. Look on Find-A-Grave.com for Seaborn or Forrest Crowley in the Old Roswell Cemetery and you will see where I will be spending my Saturday. Seaborn’s father was George Washington Crowley. I can’t find his grave. Does anyone know where it might be? It shows he died 1851 – Trinty, Morgan, Alabama, USA. Thanks. I had only looked for him in Ga.
Crowley Descendants – we have a few options to consider here in getting the Historic Crowley Family Cemetery back under control. I attended the DeKalb Cemetery Preservations Meeting yesterday at the DeKalb Historic Court House and received so great information to move this forward into protection. Brenton Head (Son of Caroyln Hudgins). 706 337-4330. What an amazing “Clean Up Day” we had at the Historic Crowley Family Cemetery today, we accomplished all we had on the “To Get Done List”. Trash, Weeds, Landscaping. I was proud when we left 🙂 ❤ Brenton Head 706 337-4330. Brenton, do you have any pics I could share? Sorry I could not come, have a sick boy at home. Yes I have before and after. And the Family Members and Community Members that also helped. Myself, James Piatt, Harold Head Jr (My Father), Marsha Lunford and her Boy Friend Ricky who fixed the Locking piece on the Iron Gate with his Blow Torch, Michael Hudgins and his Sister In-Law. Forrest Hill and his Wife stopped by to see and talk for a minute. A lot of Community People stopped by to see what we were doing and gather more information since no one knows anything about the Cemetery. Brenton Head son of Carolyn “Hudgins” Head. Pat – give me your home e-mail so I can send the pictures. I am not sure how to post them on here direct. My email is ptatummiller@gmail.com. Thanks so much for what you did today. I would like the pictures also. maurinekennedy10@gmail.com If there is anyway for you to say who is who that would be helpful.. I would love to see my cousins! Thanks to everyone who helped clean up the cemetery. What a labor of love that was! Special thanks to the community members who helped. Wow, thanks for the pictures! You all really did a wonderful job!! It truly was overgrown, to put it mildly. It truly was and very sad, I was proud when we left. We planted a lot of Flowers that should make it more beautiful for the future. Main Contacts : Crowley Historic Family Cemetery – Midway Road and Memorial Dr. Atlanta, GA DeKalb County. I could not figure out how to post the new pictures from the Clean Up Day we had last Sunday, May 22nd 2016. It was a mess when we started but when we got through it was 100% better. And we did some Landscaping with knockout roses, Yellow Rose of Texas, Canna’s, Lipstick Flowers. Which once established will help block out weeds and we also Mulched. Brenton Head 706 337-4330. I wanted the Local Paper to do a Follow up on it since there were people from the Community Helping as well. That entire Lot is another story!!! Brenton, I didn’t see any pictures that had the flowers. It all sounds so pretty now. If you have any pics that show the flowers i would love to see. Y’all really did an excellent job. When i look at the before pictures I am amazed that you got it cleaned up and looking good. If you email the pics to me at traci.rylands@gmail.com, I can post them on the blog’s Facebook page. Will there be another clean up day this spring? If so, I would love to participate and perhaps help to organize some sort of reunion where we could all meet one another. Traci – where are the New Pictures Posted from the Clean Up Day? Go to the Adventures in Cemetery Hopping page in Facebook. It is an open page, not a closed group. They are also posted to Georgia History Through Pictures’s Facebook page. I’m so excited to find this! My mother-in-law took me to this cemetery years ago – I thought someone from her family was buried there. I can’t imagine who that might have been. She was born in Pennsylvania in 1916 and moved to Decatur as a young girl. She finished high school in Decatur and attended Georgia State College for Women in Milledgeville. Her maiden name was Koebley. The Crowley family has a long and interesting history. Some of them are buried in Old Roswell Cemetery as well. James Crowley was my 4th great grandfather. Is there an update on the cemetery? Interested in knowing if there is info on the Hudgins family also buried here. According to plaque there are three families buried there. No Hudgins Buried in the Crowley Cemetery. They are in the Hudgins Cemetery on Midway Rd, about a mile from the Crowley Cemetery.